Abstract: The copper core in the AVC112C81 extends roughly 5mm into the base in a pre-drilled hole, bringing better thermal conductivity into the equation. Extruded aluminum heatsinks are loosing their foothold as processors have increased in heat output past the point where they can really cool "well." Or at least, that's the indication for simple heatsink extrusion designs. In an effort to extend the usefulness of the otherwise good extrusion dies, manufacturers have taken to adding copper cores. The copper core in the AVC112C81 extends roughly 5mm into the base in a pre-drilled hole, bringing better thermal conductivity into the equation. With the core of the silicon chip in direct contact with the 30mm diameter copper core insert, heat energy can be transferred from the microprocessor and spread out to a larger surface area before being picked up by the aluminum extrusion. In that sense, the copper core enlarges the working section of the extrusion, and that can help make the heatsink more efficient. This cooling technology is also useful as the core size of today's chips continues to shrink. 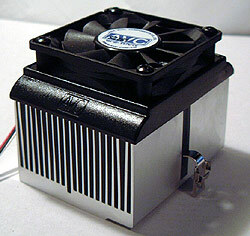 A heatsink cannot cool a small 180mm (squared) patch as efficiently as it can a much larger sized heat source. With sizes that small, issues of lateral heat flow within the base of the heatsink come into play, and that can hamper things. The AVC 112C81 is AMD approved for processors along the lines of the AthlonXP 2600+ so we already know that performance is acceptable, but the real question remains - "just how good?"